PRESS BOOK "STORY FOR AN EMPTY THEATRE"
Press Book "THE LAST STEP OF ACROBAT"
Old Baruch, with his white beard and gold-rim glasses, often told me: Words are not things, but their absence. I would remain still, and in silence I’d watch him search through papers, place his thick fingers in a book, lick his finger and flip through the pages, take his glasses off, nod with his head, only once, before closing his eyes. I always thought in that loft, filled with all the drafts that stole in from the mountains, old Baruch, with his white beard and gold-rim glasses, would have hidden some secret, many years before, perhaps inside the pages of a book, among the time-yellowed papers, or in the crease of dust, inside a feathered nest resting on some shelf. A secret that even he had then forgotten, along with where he had hidden it, and now he was trying to retrace his steps, passing all those hours, every day till darkness fell, whenever I went to see him, every time I went there, shuffling through those papers, taking off his glasses, dipping his finger in the inkwell of his mouth, before closing his eyes. Words are not things, old Baruch kept repeating in those days, but their absence. Those days, I smoked cigarettes without a filter. Better yet, I rolled them leisurely: I’d take tobacco from the pouch with Pueblo stamped on it, and I’d gently spread a pinch of it on a thin paper, squeeze the two ends between index and thumb, roll it and bring it to my mouth, lick one long edge with the tip of my tongue and run my fingers along the tobacco, as if trying to caress it. In stillness I’d smoke that cigarette, thick in the middle and thin at the ends; then I’d remain there absent-minded, staring at the smoke caught in the air, drawn out the window, outside that loft and its secret, before I’d close my eyes. Those days, now and then I’d think about words and about things, about the absence of things, within the words themselves. Then, once, I don’t remember precisely what day it was, when darkness had almost enveloped us, one of those days filled with cigarettes and smoke coiled in the air, old Baruch said that he wanted to show me something, something he had found, or better yet found again, among the piles of books, the tangle of faded and eaten away papers, in a corner of the loft. So that day, when all was darkness, I saw old Baruch take a thick candle and light it with a match, and then pull out, from where I have no idea, a heavy book with a dark brown leather binding, a thick cover with nothing written on it. Old Baruch, his rim glasses and his thick white beard, wetting a finger on the tip of his tongue, opened the book and said to me: I have no idea how it ended up here, I don’t know where it came from or whose it is. I’ve called it The Book of Omens. And so that day, that day of smoke yielding to darkness, in the light of a thick candle I picked up the book, and during the entire time I leafed through it, old Baruch remained in front of me; he had taken off his glasses and was now stroking his white beard, his eyes closed. There were no words in the book, no sign that might indicate some form of writing. There were only images. Black and white photographs, to be exact, of things rising out of darkness, as if caught by a thin whisper of light, or better yet of smoke. Imperceptible powder that laid upon those objects, suspended in a space, where time did not exist, or had no place to call home. At least that’s what it seemed, at first sight. I took the book from the table where old Baruch had placed it, white beard and rim eyeglasses, I laid it on my knees and I bent over to leaf through it, more closely, barely wetting the index on the tip of my tongue. So while flipping through the pages, I asked myself almost without thinking, like a smoke ring forms over your head, without meaning to, I asked myself that day what I was really looking at. I then closed the book and took from old Baruch’s table one of those yellowed sheets of paper, and without opening the book any more, I began writing on that sheet the things I had looked at and those I had seen when I looked, as I had turned one by one the pages of the book, stooped over my knees. I never thought I’d find these, really. I thought, going back to those days, old Baruch thoughtfully stroking his beard, his eyes closed, I thought I had simply written a list, a catalogue which today, after such a long time, could restore the vertigo of those photos, of that book. A vertigo which had not ceased even after I had closed it and put it back on the table. A vertigo, now I know for certain, which that day, only by the light of a candle, I had tried to conceal, to stem, by writing those words I thought were a list, a list which they are not. What I really saw, what one really sees, I learned, one learns it only much later, better yet, after having forgotten how much time has gone by, after having forgotten time itself. In actual fact, there were no windows, broken panes, shadows on walls, stuffed birds, empty chairs or postcards hung on a string with clothes pins. All these things were indeed in the images of the book. But they were not those. Because even things are not the things themselves. And those were an absence, I don’t know for sure if of someone already gone, or of someone still to come, it doesn’t matter. Perhaps every image tries to capture, to imagine this absence, this something missing which exists outside of time itself, a time missed, just before something happens. Shortly after. That’s why every image can be an omen, a presage, able to contain a destiny, to reveal a mystery. My list is not a list. As it was, my list turned into a vertigo. I listed those things in a row, I put words to them without understanding, and without thinking the things disappeared, what came out was their absence, what has remained and is still felt, on that sheet of paper slipped in the pages of Thomas Bernhard’s Correction, so long ago, I can’t imagine how long. In the end, quite some time has gone by. Here I am, white beard and rim glasses. Today is again one of those days when darkness comes suddenly, beyond the courtyard the cyclamens are stirring, the hedge leaves tell me the wind has picked up. I no longer smoke, time for this has passed as well. I close my eyes and stay still, waiting; in the rising darkness I think back to old Baruch, his thick fingers the white beard, while he searches his hidden secret in the loft, an omen of those days long gone. Good old Baruch and I, we know where it is, but we don’t care to take it out, it wouldn’t be a secret anymore, would it. We’d no longer feel its, their absence. Il buon Baruch, la barba bianca e gli occhiali cerchiati d’oro, mi diceva spesso: Le parole non sono le cose, ma la loro mancanza. Io restavo immobile, in silenzio, e lo guardavo rovistare tra le carte, mettere le dita grosse dentro un libro, intingere l’indice di saliva alla bocca, e sfogliare, togliersi gli occhiali, fare un cenno con la testa, uno soltanto, prima di chiudere gli occhi. Ho sempre pensato che il buon Baruch, barba bianca e occhiali d’oro, in quella soffitta, piena di tutti gli spifferi che s’infilavano dalle montagne, avesse riposto un qualche segreto, tanti anni prima, magari dentro la pagina di un libro, tra le carte ingiallite nel tempo, le pieghe della polvere, in qualche nido di penne, appoggiato a una mensola. Un segreto che anche lui aveva poi dimenticato, insieme al posto dove l’aveva nascosto, e ora cercava di tornare su quel sentiero, passava tutte quelle ore, fino al buio di ogni giorno, quando l’andavo a trovare, tutti i giorni che c’andavo, a rovistare tra le carte, togliersi gli occhiali, intingere l’indice nell’inchiostro della bocca, prima di chiudere gli occhi. Le parole non sono le cose, ripeteva il buon Baruch dentro quei giorni, ma la loro mancanza. Io invece quei giorni fumavo sigarette senza filtro, anzi le arrotolavo piano, prendevo il tabacco dal sacchetto con sopra la scritta Pueblo e ne posavo con dolcezza un mucchietto su di un foglio sottile, stringevo le due estremità tra le dita e lo portavo alla bocca, bagnavo il foglio con la punta della lingua e facevo scorrere le dita, quasi volessi accarezzarlo, il tabacco. Fumavo in silenzio quella sigaretta con la pancia al centro, più sottile all’inizio e alla fine, poi restavo imbambolato a fissare il fumo che prendeva la strada dell’aria, usciva fuori dalla finestra, fuori da quella soffitta e dal suo segreto, prima di chiudere gli occhi. Pensavo, ogni tanto alle parole e alle cose, quei giorni, all’assenza delle cose, dentro le parole. Poi, una volta, non ricordo bene quale giorno fosse, quando il buio era quasi tutto intorno a noi, uno di quei giorni pieno di sigarette e fumo arrotolato nell’aria, il buon Baruch disse che voleva farmi vedere qualcosa, qualcosa che aveva trovato, o forse meglio dire ritrovato, tra le pile dei libri, i labirinti di carte pallide e smangiate, in un angolo della soffitta. 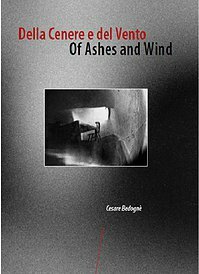 Così quel giorno, quando tutto era nel buio, ho visto il buon Baruch prendere una candela grossa e accenderla con un fiammifero e poi tirare fuori, da non so dove, un grosso libro, con la copertina di pelle marrone scuro, una copertina spessa, senza niente scritto sopra. Il buon Baruch, gli occhiali cerchiati e la barba bianca e spessa, intingendo un dito sulla punta della lingua, ha aperto il libro e mi ha detto: Non so come è finito qui, non so da dove viene e di chi è. Io l’ho chiamato Il libro del presagio. E così quel giorno, quel giorno di fumo arreso al buio, alla luce di una grossa candela io ho preso il libro e l’ho sfogliato e di fronte a me, per tutto il tempo è rimasto il buon Baruch, che s’era tolto gli occhiali e ora si lisciava la barba bianca, a occhi chiusi. Nel libro non c’erano parole, nessun segno che facesse pensare a qualche forma di scrittura. C’erano solo immagini. Fotografie in bianco e nero, per la precisione, di cose venute fuori dal buio, come prese da un vento sottile di luce, o meglio un fumo. Polvere invisibile che si posava su quelle cose, sospese in uno spazio, dove il tempo non c’era, o non aveva nessun posto dove stare. Almeno così mi è sembrato, al primo sguardo. Ho preso il libro dal tavolo dove l’aveva appoggiato il buon Baruch, barba bianca e occhiali cerchiati, l’ho messo sulle ginocchia e mi sono chinato per sfogliarlo, più da vicino, intingendo appena l’indice sulla punta della lingua. Così mentre sfogliavo le pagine mi sono chiesto, ma quasi senza pensare, come un cerchio di fumo che si forma sopra la testa, involontariamente, mi sono chiesto quel giorno cosa stavo davvero guardando. Ho poi chiuso il libro e ho preso dal tavolo del buon Baruch uno di quei fogli ingialliti e senza più aprire il libro mi sono messo a scrivere su quel foglio le cose che avevo guardato e quelle che avevo visto guardando, mentre sfogliavo una per una le pagine del libro, chinato sulle mie ginocchia. Non pensavo di trovarci queste, davvero. Pensavo, ripensando a quei giorni, il buon Baruch assorto a lisciarsi la barba bianca, gli occhi chiusi, pensavo di aver scritto semplicemente una lista, un elenco che oggi, dopo tanto tempo, mi poteva restituire la vertigine di quelle foto, di quel libro. Una vertigine che non s’era fermata neppure quando l’avevo chiuso e rimesso sul tavolo. Una vertigine, lo so adesso con precisione, che quel giorno, nella luce soltanto di una candela, io avevo cercato di nascondere, di arginare, scrivendo quelle parole che credevo fossero una lista, che una lista non sono. Cosa ho visto davvero, cosa si vede per davvero, l’ho scoperto, lo si scopre soltanto dopo tanto tempo, anzi, dopo aver dimenticato quanto tempo è passato, dopo aver dimenticato tutto il tempo. Non c’erano infatti finestre, vetri rotti, ombre sui muri, uccelli impagliati, seggiole vuote o cartoline appese a un filo con le mollette. C’erano tutte queste cose nelle immagini del libro. Ma non erano quelle. Perché anche le cose non sono le cose. E quelle erano un’assenza, non so bene se di qualcuno già passato, o di qualcuno che doveva ancora venire, non importa. Ogni immagine forse, cerca di cogliere, d’immaginare quest’assenza, mancanza che abita fuori dal tempo, mancanza di tempo, appena prima che qualcosa accada. Appena dopo. Ecco perché ogni immagine può essere un presagio, contenere un destino, rivelare un mistero. La mia lista non è una lista. La mia lista così è diventata una vertigine. Ho messo in fila quelle cose, le ho messe in parole e senza capirlo, senza pensarci le cose sono scomparse, è venuta fuori la loro mancanza, quello che resta ancora e si sente, sul foglio infilato tra le pagine di Correzione di Thomas Bernhard, tanto tempo fa, non so quanto. Così alla fine, è passato anche del tempo. Io sono qui, la barba bianca e gli occhiali cerchiati. Anche oggi è uno di quei giorni dove di colpo arriva il buio, fuori dal cortile si muovono i ciclamini, le foglie di una siepe mi dicono che s’è alzato il vento. Non fumo più, anche per questo, è passato del tempo. Chiudo gli occhi e resto così ad aspettare, nel buio che viene mi torna in mente il buon Baruch, le dita spesse la barba bianca, mentre cerca in soffitta il suo segreto nascosto, presagio di quei giorni perduti. Io e lui, il buon Baruch, sappiamo dov’è ma non c’interessa tirarlo fuori, non sarebbe più un segreto, ecco perché. Non sentiremmo più la sua, la loro mancanza.